This is the kind of music you just can’t sit still to! Originating in the 1930s, Soukous is a mix of Congolese and other traditional African sounds along with a strong dose of Caribbean and South American flavours. 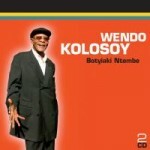 The most famous star of this music is “Papa” Wendo Kolosoy who toured Europe and North America during the 1940s and 1950s with his band Victoria Bakolo Miziki. Listen to one of his most famous songs, Marie-Louise, on at this YouTube Link. 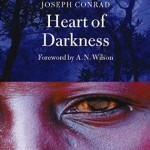 2010 saw a revival of interest in the cool Congo Jazz of the 1950s. The Mountain Gorilla is an endangered species that lives within four national parks, including Virunga National Park in eastern DR Congo. 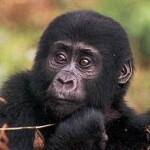 Mountain Gorillas have very thick fur that insulates them from the cold in the volcanic mountains where they live. Adult males are called ‘silverbacks’ because they have a saddle of silver-colored hair on their backs. Males weigh, on average, a hefty 220 kg (490 lb). Substantial efforts are underway to save this remarkable animal. Today, the Mountain Gorilla population is on the rise. The Okapi Wildlife Reserve is home to about 5,000 of the estimated 30,000 okapi surviving in the wild, plus other threatened species of birds and primates, such as the forest elephant. Located in the north-east region, the Reserve has dramatic scenery and is home to nomadic pygmy Mbuti hunters and Bantu farmers. 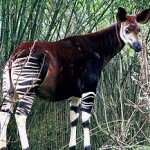 So what IS an okapi? The Okapi is shaped like a giraffe with a short neck, but has black and white striped legs like a zebra and dark reddish bodies. 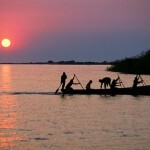 Lake Tanganyika is one of the Great Lakes in Africa. It is not only the longest lake in the world (670 km), it is also the second largest fresh water lake in the world by volume, and the second deepest lake in the world. Lake Tanganyika is home to more than 250 unique species of fish, some of which are now threatened. Fishing provides a dietary staple for the people who live around the lake. The Congolese are avid footballers, whether kicking a ball in the town square or watching the national team, nicknamed the Leopards. 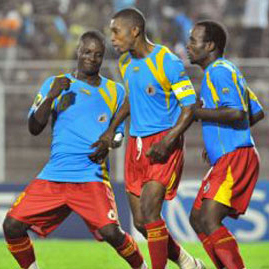 In 2009, the DR Congo Leopards won the African Nations Championship. 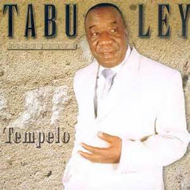 Tabu Ley was a much-loved Congolese singer-songwriter who created the unique danceable “African rumba”, or “soukous ,” from a fusion of local and international musical styles. He started out in the mi-1950s with his band, L’African Jazz, and ultimately composed more than 2000 songs and produced 250 albums. He died on November 30, 2013. Listen! See the early days.